I have been writing a series of articles on Joia Rara, the soap opera currently running on Globo TV in Brazil (links to the other articles are at the bottom). One thing I did not have room for in my previous articles was to take a look at some of the smaller characters parts. The main story arc of the soap opera is focused on the fall and redemption of Ernest Hauser, played by the magnificent José de Abreu, and the impact of his devastating actions on both his three legitimate children and Manfred, a fourth child who Manfred still thinks is his illegitimate child (all four of whom are adults). However, an understanding of what makes Joia Rara so utterly compelling as an authentically complete drama is the way in which the dramas, tragedies and joys of the other characters interweave in and out of this main story arc, and it is some of these other characters, and the actors behind these performances I would now like to explore. To start on a happy note we finally saw the wedding of Matilde, played by Fabiula Nascimento e Sonan, played by Caio Blat. This romance blossomed so to speak while Sonan was still a Tibetan monk, and he suffered greatly discovering his feelings for Matilde, while still honouring his vows to Buddhism. In just one example of the spirituality of this soap opera not seen anywhere else, it is revealed that Rinpoche Ananda (who has now reincarnated as the young Pérola) saw in a vision that he would one day meet his soul mate, a soul mate who he had been together with in previous lives. Hence despite many challenges and Matilde being on the point of marrying another, they united together and celebrated in a beautifully shot Buddhist wedding, simple, elegant and deeply soulful. It is interesting as so many times in this soap opera we have seen karma at work. Not for Matilde though who is a simple humble soul with no beef with anyone. Her character can be contrasted with diva Aurora, played by actress Mariana Ximenes and her romance with the disabled yet dashing Davi (Leandro Lima). The reason why Lima’s performance stands out for me is that often you feel that disabled characters are added into shows as tokenism, and often do not feel authentic. What is great about Davi is that he is a disabled character who is at the same time actually a bit of an arse. Aurora is truly in love with Davi, who due to his disability could not find work. Aurora colluded with the manager of the local gentlemen’s club, offering to pay his wages if Davi could be the manager. While being fully qualified for the job, he found out about this plan, and said he wanted nothing more to do with Aurora, now that he could no longer trust her. In an emotional scene, and one which developed her character further than the more comedy driven story lines previously, Aurora implores Davi to give her a chance. “Can’t you see I am sorry, and that I am begging for forgiveness?” Here sh is right in front of him, and yet stubborn arse that he is, he just can’t see what we the audience see. There are some huge lessons in Joia Rara, and this is one which can be seen as a prototypical instance of the dynamics of seeing. ‘The eye only sees what the mind is willing to comprehend’ as Henri Bergon put it. Writers Thelma Guedes e Duca Rachid really have woven some masterfully intersecting stories which ebb and flow in and out of each other in this glorious cosmic play. 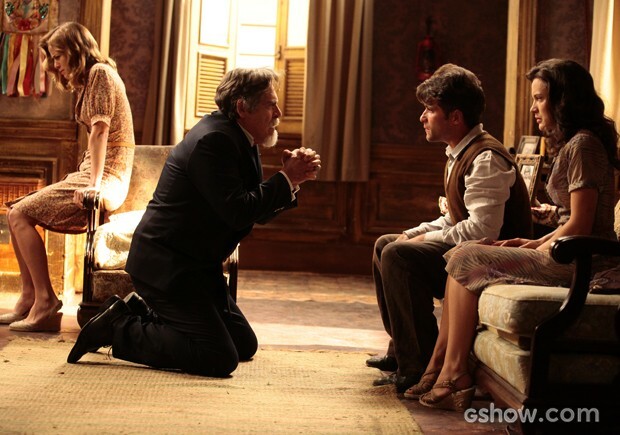 The troubles of Aurora and Davi play out with the anguish suffered by Fabrico (Ricardo Pereira) and Lola (Leticia Spiller). Pereira himself is a hugely accomplished actor, but until recently he was more a peripheral character in this soap opera. But his love for Lola is shattered when she finally plucks up the courage to tell him that ten years ago she betrayed him and his communist friends to Manfred, an act which led to them being imprisoned. I mentioned in my previous article the intensity of some of the main performances, but here in these supporting roles, really, the acting is superb and cannot be faulted. At this moment in time, Fabrico is now friends with Aurora, and Lola is friends with Davi, no funny business, but mixing it up and spreading rumours and gossip, as he does so with so many other characters, is the hugely enjoyable Joel (Marcelo Médici). The final couple in I really need to mention is Joel who is gay, and Creotina who is the young and naive friend who longs to marry him. I mentioned the comedy genius of Médici in my last article, but what really needs to be said here is that there is a ridiculously and infectiously funny interplay between him and the superb Luana Martau. It seems to me that there are far fewer female comedians than male, and in Brazil while there are certainly a few, I really think Martau deserves a huge amount of recognition as for me this type of comedic role is sure one of the most difficult to achieve, in that her performance is wonderfully whimsical rather than relying on the broad brushstrokes of slapstick or farce. (I should also add that Martau is I think an extremely accomplished actress playing a comedy role, as opposed to being a comedienne). One final thing needs to be said. During one or two of the ad breaks in Joia Rara you get a very brief news update, and recently this just seems to be violence and crime and rioting in Brazil. of course Brazil is not the only place where this is happening, and countries which have been deserted by their leaders almost inevitably descend into disorder. I have discovered that José de Abreu had to flee Brazil in the 1970s during the dictatorial period, joining musicians such as Gilberto Gill and Caetano Veloso in exhale in Europe. I am therefore grateful for receiving support from those members of the cast and team of Joia Rara, as well as from the Joia Rara fan page on Facebook for my writings, trying to offer a more cultured and positive view of this suffering country. (And just a quick note for my Brazilian readers – Maria has gratefully offered to help translate my previous article Compassion, Forgiveness and Joia Rara into Portuguese, so this will be published soon). Joia Rara offers a rare escape from the crassness of the mass media and an excellent education of leadership, ethics and human values, all delivered by a stellar cast who now, as I was discussing with Maria, are really coming together delivering a single unified and authentic performance in this soon to end soap opera.